Posted May 6, 2016 by Jeff McCollough & filed under Preventative Maintenance. With the beautiful spring weather often comes not so beautiful gas prices. You may have already noticed rising gas prices in the past few weeks. Whether you are constantly driving the kids to practice or plan to take a road trip this summer, the last thing you want to worry about is how fuel prices will affect your budget. Fortunately, we have some great tips to help keep your costs to a minimum. Having a professional take a look at your vehicle is the easiest way to ensure everything is running efficiently and avoid burning up gas for no reason. Maximize your fuel economy by scheduling a regular tune-up and maintenance check, which will include having your air filters checked and replaced, if necessary. According to EcoWatch, a proper tune-up can boost your vehicle’s gas mileage by as much as 4 percent. Changing out a dirty filter can help by 10 percent, while using specified oil up can save another 2 percent. Most surprising, if your tune up discovers a faulty oxygen sensor, you could get back as much as an additional 40 percent! Your tires are what keeps your vehicle afloat. When not inflated properly, your engine has to work harder to keep moving, which means your vehicle will become thirstier for fuel. Be sure to check your tire pressure monthly since shifting weather temperatures can set it off kilter. Your manual will give you the optimal pressure to inflate to, and many cars will also include this information on a sticker inside the driver’s side door. 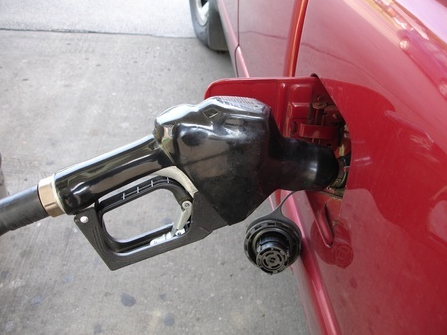 Do you often find yourself hurrying at the gas station instead of carefully tightening your gas cap? Or maybe you’ve lost your gas cap? Not only are you wasting money, you might be releasing harmful vapors into the environment. Loose, damaged or missing gas caps cause 147 million gallons of gas to vaporize each year, says EcoWatch. Just think of all the money lost! In addition to maintenance, you can change a few habits to help you save on gas costs. First, watch your driving technique. Sudden starts and stops and aggressive driving maneuvers can decrease your efficiency and even damage your vehicle over time. Plus, turning your car off instead of idling for minutes at a time can help! You can also use your windows instead of the A/C when not driving at highway speeds to even further offset rising gas prices.